Nestled in a valley in the Rocky Mountains, this mountain-modern home fits right into the Colorado landscape. 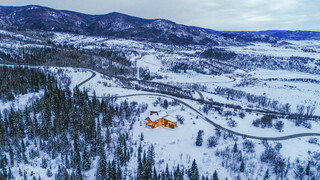 The close proximity to Steamboat Springs and views of the South Valley, the Flat Tops and Emerald Mountain inspired architecture with expansive glass, interiors that encourage après-ski entertaining, and a rustic-meets-modern style. Lead designer Leslie Dapper of Rumor Design + reDesign joined the project during the early planning phase, before construction began. She chose all the finishes for the new build, including the lighting, flooring, tile, cabinetry and countertops. “Mountain-modern style meant using some familiar materials but in contemporary ways that were slick and shiny,” she says.